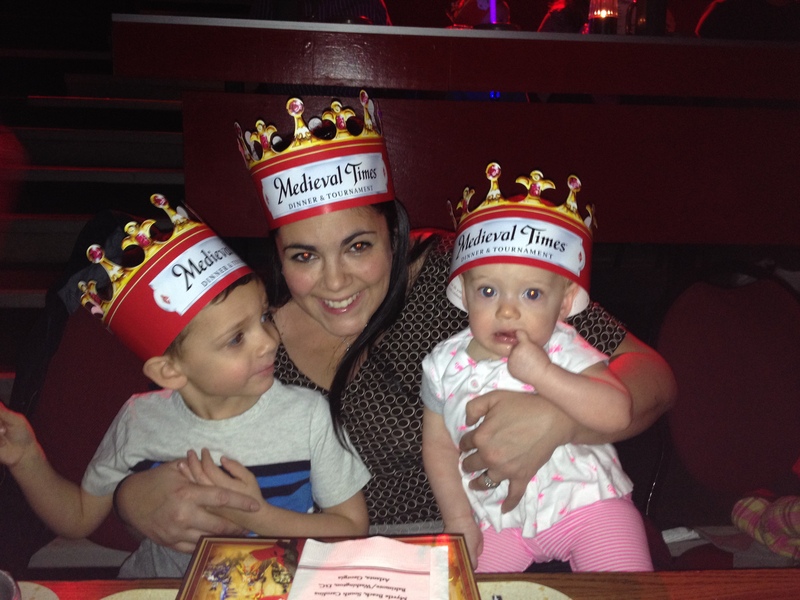 Family Fun at Medieval Times + GIVEAWAY! Since getting castle and knight Lego for Christmas, Andrew has been obsessed with playing knights. ALL. THE. TIME. 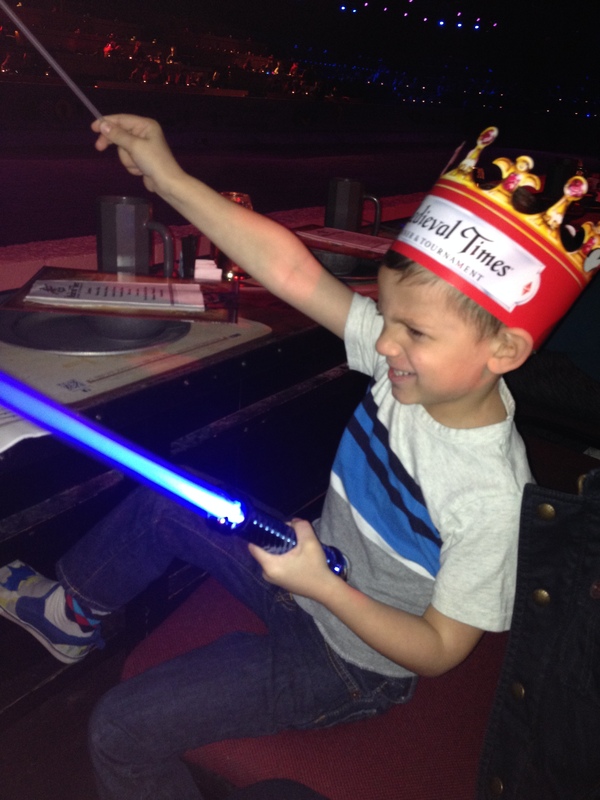 So when I was invited to take him to Medieval Times in Toronto, I jumped at the chance. Because Ry and I are sneaky parents, we didn’t even tell him where we were going – we just said we were going out to eat for lunch. 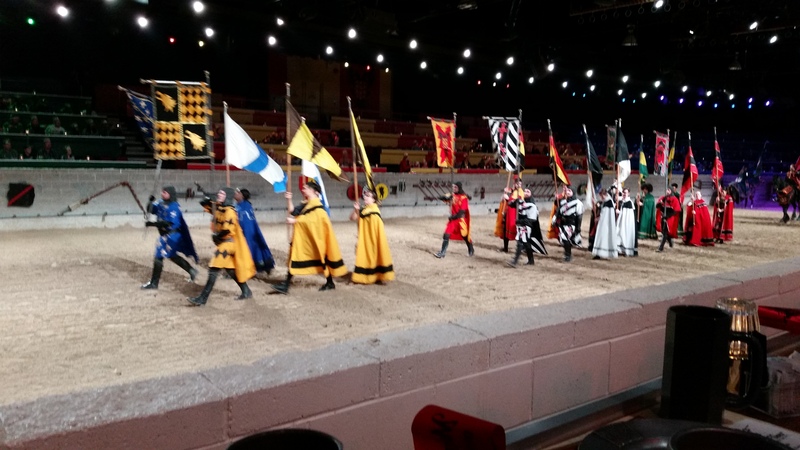 So you can imagine the look on Andrew’s face when we walked into Medieval Times – from the moment you walk in, it’s like you are transported back in time. Even at the ticketing desk, staff is costumed, speaking in Olde English, and are fully committed to their roles. 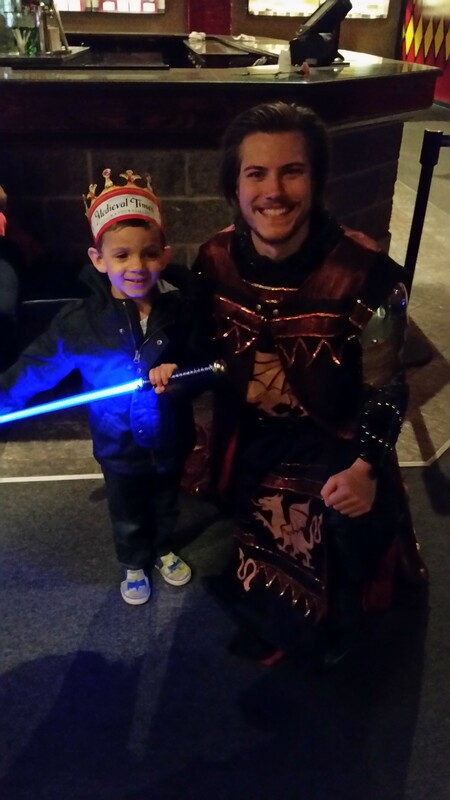 Andrew’s eyes just about popped out of his head and he said in awe, “Mommy – I think there are knights here. And horses!” Well played, Medieval Times! The excitement started literally from the minute we walked in the door. One thing I loved is that there is a ton of stimulation to keep kids (even infants) entertained from start to finish. Even waiting to enter the arena, they do a cheering contest to see who will enter first. Next stop in the castle was a room that could send parents into terror mode – a room full of kiosks full of toy swords and crowns, and anything else Medieval Times-related that a kid could dream of. Andrew’s eyes lit up again as he took in all the toys the other kids were playing with: “Can I have a sword? I want a light up sword! He has a crown! That boy has a cape! A stuffed dragon!” Immediately, I’m thinking “Man, how much is this going to cost us?” We were happily surprised – not much. 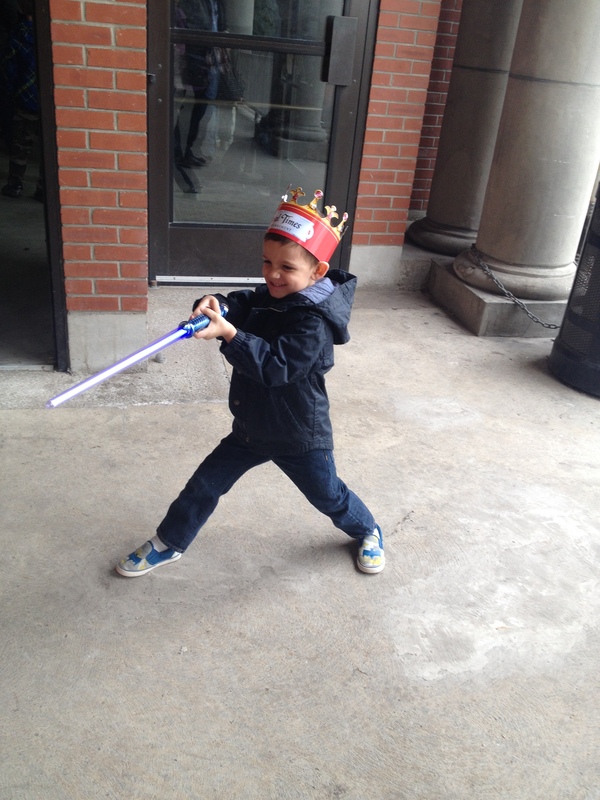 The toys were pretty affordable, and Andrew was thrilled with a $5 light up sword (and as a sidenote – it’s a few weeks later and the sword still works. Totally worth the $5). Adding to the glee all of us felt when buying the sword was the interaction we had with the young woman working the kiosk. When she handed Andrew his blue light up sword, it wasn’t working great (wouldn’t turn on every time he pressed the button, etc). I just figured “Meh, it’s a $5 toy what can you expect?” The salesgirl noticed it wasn’t working right and said she would get him a different one. She noticed that they were sold out of blue (Andrew’s colour of choice), and I braced myself for a preschooler meltdown…but then she asked for our seating card to see where we are, and offered to find another one and deliver it to our seats. Seriously? Way more than I was expecting! Another bonus – if you are able to make it through without buying a souvenir (but seriously why not for the price?! ), there are souvenirs included at your seat! Each of us had a program to take home (which Andrew has memorized now) and a coloured flag to cheer for your knight. The show itself was great for young and old alike. I seriously had a lot of fun – and Andrew’s joy was the icing on the cake. The story was easy enough for him to follow, and they had lots of knight competitions to keep him enthralled. The flight of the falcon was pretty awesome too – even Lily sat completely still watching him soar around the arena. 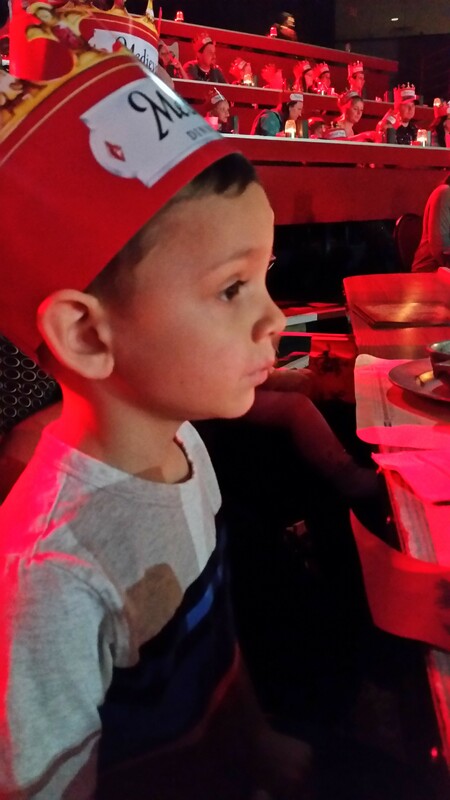 The show was non-stop fun, and really exciting – Andrew loved the sparks flying off the swords. I was seriously impressed by how talented the knights and horses are. They must spend SO much time training and practicing. 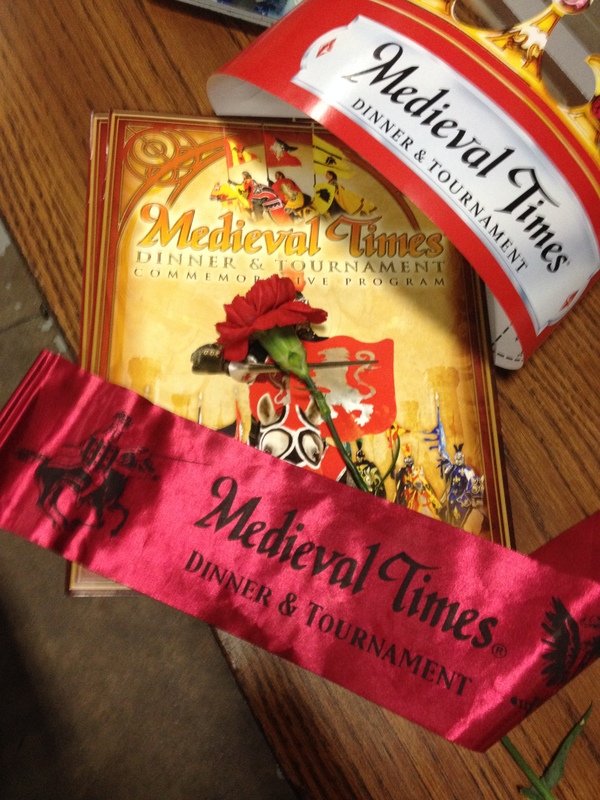 At the end of the tournament, our very own Red Knight was the winner, and a little girl from our section was chosen as the Queen of the Tournament. I won’t lie – it was pretty exciting to be in the winning section! We were cheering our heads off! The food was actually better than I was expecting , and the portions were huge. It was a yummy feast of tomato soup, roast chicken, potatoes, corn on the cob, garlic bread and a butter tart for dessert. Be prepared though – you actually do eat the entire meal without utensils. If you’re going with little ones, I would recommend bringing baby wipes with you. They do hand out wet wipes near the end of the meal, but I found I needed them earlier for Andrew because he was so messy. He thought it was the funniest thing to eat chicken and potatoes with our hands, and drink ‘dragon’s blood’ soup from a bowl with a handle. The knights do such a great job of engaging with the crowd, making everyone feel involved in the show. Lily and I even got a rose from hunky Red Knight! At two hours, I felt like it was the perfect length – not too short that it was over too soon, but not too long that kids get antsy. Andrew is a pretty high-energy kid and he had no problem sitting through the show, he was attentive and engaged the entire time. After the show, the King and Queen and one of the knights are available in the lobby for pictures and autographs. Another bonus was the parking – for Toronto, it was surprisingly reasonable (only $11 on Saturday afternoon), and was literally right next door. It took us less than a minute to go from the front doors of the castle to our car. Perfect when you’re lugging little ones around! Does that sound like a fun afternoon or evening for you? 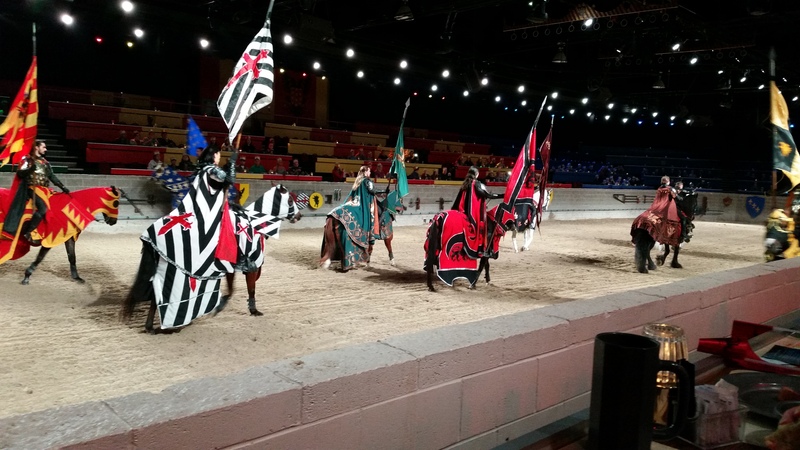 Medieval Times Toronto is giving one lucky reader the opportunity to win TWO tickets to see a show at the Toronto Castle for any available show in April! Head over to Bawlers & Crawler’s Facebook page here to find out how you can win! This entry was posted in Giveaways, Things To Do and tagged castle, family fun, knights, medieval times, things to do, toronto.